A DTL transformation is a transformation that you create and edit the transformation visually in the DTL editor, available in either the Management Portal or Studio. The DTL editor is meant for use by nontechnical users. The term DTL represents Data Transformation Language, which is the XML-based language that Ensemble uses internally to represent the definition of a transformation that you create in this editor. You can invoke a data transformation from a business process, another data transformation, or a business rule. Note that there is overlap among the options available in business processes, data transformations, and business rules. For a comparison, see Comparison of Business Logic Tools in Developing Ensemble Productions. To access this page in the Management Portal, click Ensemble > Build > Data Transformations. The lower part of the left area displays a table that lists the actions defined in the DTL transformation. When Ensemble uses this transformation, it performs these actions in order as listed here. Transform  Enables you to edit information about the transformation. For details, see Specifying Transformation Details, later in this book. Tools  Enables you to launch a wizard to test the currently displayed transformation. For details, see Testing Data Transformations, later in this book. 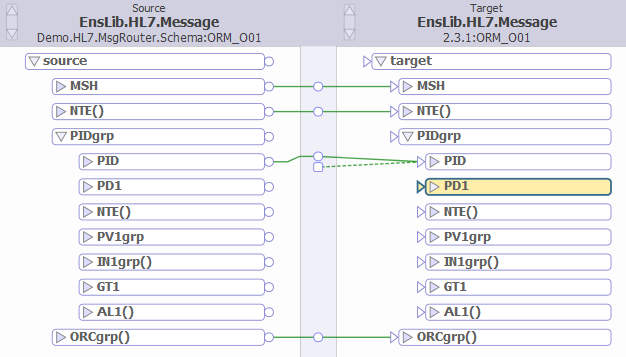 The following shows the DTL diagram for another sample, Demo.HL7.MsgRouter.ORMLastNameTransform, which is also in the ENSDEMO namespace. In this case, the source and target messages are virtual documents (which are discussed in Ensemble Virtual Documents). Notice that all the properties displayed are either collection properties (shown with parentheses at the ends of their names) or contain sub-properties. It is common for virtual documents to be complex as shown in this example. Also note that in the column header, below each class name, there is an additional label. These labels indicate the DocType of the source and target messages. For information on DocType, see Ensemble Virtual Documents. The Data Transformation List page lists the data transformation classes defined in the current namespace. To access this page, click Ensemble > List > Data Transformations. Custom transformations are displayed in black. These classes are based on Ens.DataTransform and do not use DTL. You must edit these in Studio. For details, see the chapter Testing Data Transformations, later in this book. You can also export and import these classes as you do any other class in Ensemble. You can use the Globals page of the Management Portal (select System Explorer > Globals) or use the Export and Import commands on the Tools menu in Studio. Also, because data transformations are classes, you can edit them and work with them in the same way that you do any other class. For example, you can edit them in Studio, although the Ensemble documentation does not discuss this in any detail. From a BPL business process. See <transform> in the Ensemble Business Process Language Reference. From a business rule. See Selecting the Transformation and Target of a Send Action in Developing Business Rules.